Wednesday night at the Link Northgate station meeting, Ron Endlich of Sound Transit told the audience that they plan to weigh all the options to mitigate lost parking during and after construction at Northgate station. I, others who live in the Northgate area, and the Seattle Transit Blog editorial board urge Sound Transit to invest in a pedestrian bridge over I-5 and in increased local transit service – not a new parking garage in the middle of a Seattle urban center. Currently, there are 1,522 Park and Ride stalls at Northgate. 428 of these stalls will be displaced during station construction, but the new station will permanently eliminate only 117 stalls. Sound Transit is currently bound by the Federal Transit Administration to replace those 117 spaces. Sound Transit could seek an exemption from the FTA – with abundant private parking and the potential for Metro to re-purpose much of their Northgate-Downtown service to feed into the station, we don’t feel forging ahead with parking replacement is a good use of transit dollars. A pedestrian and bike bridge over I-5 between the station area and North Seattle Community College (NSCC). This would provide station access for students, open up further parking options, and bring Licton Springs residents to the station. It is our preferred choice. Temporary or permanent bus service improvements, which could help guide Metro’s service hours once the station opens. Leasing additional Park and Ride stalls from adjacent property owners. Northgate is an urban center. While it has been auto-oriented in the past, its future can be brighter. The Northgate Stakeholders Group and other discussions about the future of Northgate have focused on increasing the walkability and bikeabilty of the urban center. Northgate neighbors have long asked for a bridge over I-5 connecting the transit center with NSCC and Licton Springs. King County Metro research has shown that many Licton Springs neighbors choose to drive to the Park and Ride rather than walk, as the distance around I-5 is long and transit connections are poor. Simply adding a bridge will decrease the number of residents driving to the station and increase transportation options to NSCC. In addition, at $16-20 million, the bridge should be cheaper than a parking garage, freeing up money to improve sidewalks around the station. Scarce transit dollars would be better spent on pedestrian access that connects the Northgate community and that promotes active modes of transportation. With new parks, better sidewalks and crossings, library and community center investments, improvements to zoning and ironically, removal of parking minimums, we have already started down the right path. Building a parking garage on scarce station-adjacent land commits Northgate to a continued focus on cars and takes away space to grow an urban center. We can do better for Northgate, and we can do better for our investment in mass transit in Seattle. If you don’t want a parking garage in your backyard, isn’t that NIMBYISM? It appears you did not even read the post to which you mockingly refer. They’re not saying the proposed parking garage should be built elsewhere. They’re saying something different should be built. And their analysis makes a whole heckuva lotta sense, and saves taxpayers a bundle of money. I assume you won’t be pushing to spend money on a parking garage that doesn’t have to be spent. In a larger sense, this myopia of walkshed (that stations only serve one side of the freeway they abut, and have to use parking on that side of the freeway) bodes ill for the planning process for the rest of the north Link extension. Sound Transit made a fundamental bad assumption in selecting the I-5 path: That ridership is coming from Lynnwood TC and Mountlake Terrace “Station”. Indeed, the option of having the line head over to Highway 99, and *stay* on Highway 99, was never studied. The only alternative studied was to jog over to Highway 99 and then back to I-5, which was clearly an undesirable option due to circuitous routing. Since ST has committed to this fundamental error by building such an expensive parking garage, and a freeway station that only serves this parking garage, near Mountlake Terrace, the opportunity to build light rail with an actual walkshed has been lost. The same error will probably be duplicated in Federal Way, where the downtown station ought to be in the heart of the city’s business center — on Highway 99 — not scoliating over to a parking garage designed to serve freeway buses, with no walkshed. The decision on whether to build a pedestrian bridge that will nearly double Northgate Station’s walkshed and significantly reduce future Metro operating costs is one that may decide whether the rest of the line is just to serve cars, or to serve people. Thank you Brent for the lesson on how stations are best situated. I agree. Also for validating the reasons the Vision Line in Bellevue (dead horse) depended on a pedestrian bridge and moving sidewalks to ‘stitch together’ the E-W problem of having stations located next to a major freeway wasteland. Both sides of I-5 and I-405 were important walk and bike sheds. Now look at the station in Bellevue being pushed 2 blocks east of the Bus bays, with none of the cross freeway, level connections. This could well end up being what Northgate turns into. Bellevue even has another station just at the Hospital on the eastside of I-405. Two stops, one on either side of the freeway is a huge joke and embarrassment to good station planning, IMHO too. Times has a good graphic. You didn’t even bother to read your own link did you? There has been no decision either on the where the station will be or what kind of connections to the Transit Center there will be, but either of the three would be MUCH closer than the Vision Line and much easier to get to for the vast majority of riders. Of course I did ‘Anc’. The graphic shows two station locations. one starts at I-405 and runs west. The other is the diagonal closer to BTC. You didn’t bother to look at that, did you. Now that ST/Bellevue is considering a station closer to I-405, it doesn’t take a rocket scientist to connect the dots from S.Main-6th-Hospital to see there is no longer any reason for an expensive tunnel to jog west. Just make it a straight line. (Opps, I forgot politics and face saving. Yeah, it’ll wander around under the CBD for a while, doing nothing but slow running around all the curves) Silly me! This is a news article, not a spread in Highlights. You can’t just look at the pictures. I’m not sure what part of about one block you’re struggling with. It’s the use of the word ‘about’. Anytime I see that tagged onto anything the agency has their fingerprints on, I assume the worst. They generally don’t disappoint me. (as in ridership, cost and time projections). Thanks for this Renee. A pedestrian bridge is absolutely the best choice (well, short of a lid over I-5, but I’ll hold off on even dreaming about that one). I agree. A bridge would be great. There are no crossings between 92nd and Northgate Way (which is the equivalent of 110nd). Northgate Way is a nasty street for walking, and probably even worse for biking. 92nd is much nicer, but there is a significant hill to climb if you are coming from the Northgate area. In other words, a pediatrian/bike bridge at about 103rd would not only serve the folks that use the train, but anyone who wants to walk from one side of I-5 to the other in that general area. The sooner it could be built the better. As soon as it is built, it benefits people. It is not so clear that is the case with the parking garage. I ped bridge would also open up the Licton Springs for TOD. I’d also like to see the ped bridge being a pleasant thing to use. Many other ped bridges in our region are a bit freaky at times. Even the new MLTTC can get a bit scary. There’s a ped bridge at 195th in Shoreline that is terrifying when a bus or truck going under makes it shake about. A pedestrian bridge connecting NSCC and the NTC is unnecessary. There is an abundance of bus service connecting the two locations. Also, I remember people on this blog claiming the walk from Wallace’s proposed 114th Ave Vision Line stop and the BTC would be too far for people to walk, but from the NSCC to the NTC is the same distance, yet no one here is complaining it’s too far of a walk. Please be consistent, people. No one is saying a pedestrian bridge over the freeway is superior to a better sited station, which was the Vision Line claim. The choice in this case is a freeway adjacent station with an unnecessary garage,or the same station with a pedestrian bridge. You seemed to be a bit confused about topology of Northgate vs Bellevue. No, he’s just trolling. MIke may be legitimately confused or have a differing opinion, but Sam has been twisting statements out of context for a few weeks now to claim that STB is hypocritical or wrong. His claims show no logical or consistent viewpoint FOR anything, just a general desire to prove STB wrong or troll in the attempt. That’s a pretty good point, Sam. From the intersection of College Way and 100th street, transit service is frequent (under 15 minute headways, typically 5-10) using the 5, 16, 75, or 345. The walking distance from that intersection, as the crow flies, is 0.35 miles. There would be some people who use the pedestrian bridge, without a doubt. Especially if it’s designed for bicycles as well, there could be heavy use. But there are two big reasons for building the bridge: Ideological and to satisfy the FTA’s parking replacement requirement. Sound Transit can point to the bike/ped bridge, and new bike lockers, and have the FTA consider those as a suitable replacement of [some of] the parking spaces. In that sense, the bridge could pay for itself, making it a zero-sum piece of infrastructure, and further improve the connectivity between Lictin Springs/NSCC and Northgate. I agree. There are no crossings between 92nd and Northgate Way (which is the equivalent of 110nd). Northgate Way is a nasty street for walking, and probably even worse for biking. 92nd is much nicer, but there is a significant hill to climb if you are coming from the Northgate area. In other words, a pediatrian/bike bridge at about 103rd would not only serve the folks that use the train, but anyone who wants to walk from one side of I-5 to the other in that general area. It means apartments on the east side of the freeway suddenly become really appealing to students (who wants to pay for a bus when you just walk?) while giving folks on the west side of the freeway an easier chance to shop or eat at Northgate. The pedestrian bridge seems like a “no-brainer”. Furthermore, if you do believe in park-and-rides as a good idea, surely it’s better to split the parking onto both sides of the Interstate, reducing “crossing-the-Interstate” traffic, which is a bottleneck due to a shortage of crossings. Even if you want to replace the parking, “West Park-and-Ride Lot” and “East Park-and-Ride Lot” make more sense than a garage. Sam, there’s a difference between the walk distance for a transfer and the walk distance for last mile travel. 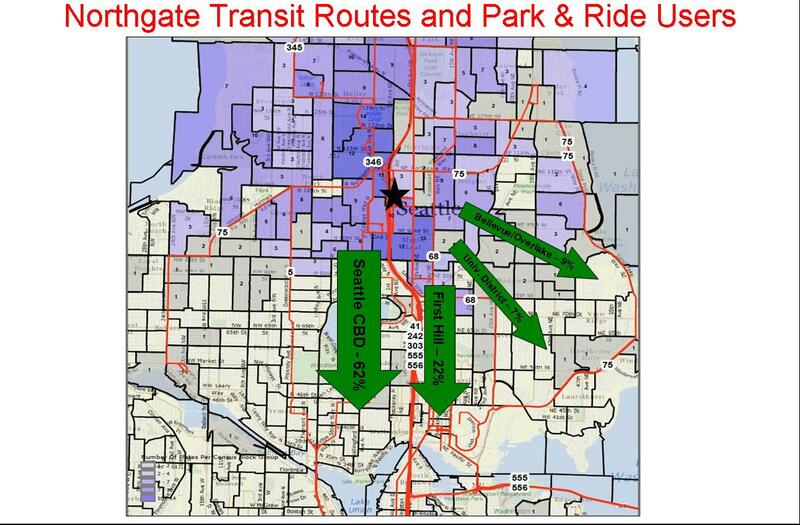 The walking distance from NSCC to Northgate Transit Center is similar to what *most* UW students walk to and from their transportation. A new bridge would make parts of those routes unnecessary. Maneuvering around the blockage that is I-5 takes a lot of time. As a result, those buses don’t run often enough or fast enough to cover other areas. It is a lot like the train from downtown to the UW. When I mentioned that, my kid said “that’s silly, there is great bus service from downtown to UW”. Of course, he is right. The problem is, those buses get bogged down serving those areas. As a result, they don’t do a very good job serving the rest of their route. Once the train is running, those buses can go from their other spots to just the UW train station. They can make that run much faster and more frequently as a result. The same could happen if the bridge is built. For example, the 16 could end at the campus. Better yet, a small bus could simply connect Aurora with the campus. Back and forth it goes, connecting the frequent bus service that (could) exist on Aurora with the frequent bus (and future train) service that exists at Northgate. “West side” and “East Side” stops for buses at Northgate, linked by the pedestrian bridge, would certainly simplify and speed up some bus routings. It really sounds as if that pedestrian bridge, if well-designed, could pay for itself in reduced operating costs. Sam, so you are in favor of wasting lots of taxpayer money sending buses to NSCC via 92nd in perpetuity. Thanks for removing my confusion in assuming you were a fiscal conservative. While I certainly agree that a ped bridge over I-5 to NSCC is preferable to a parking garage, I’m just not that upset about the prospects of ST building a 500 stall parking garage at NG. Basically this garage will be built in the NG parking lot, and converting an existing parking lot to a parking garage isn’t removing any land from potential re-development. Because, to be honest, that land is already parking and it is going to stay parking. Doing otherwise would require enlightenment on the part of the owners of NG, and that just isn’t going to happen. Additionally, ST really needs to avoid any political fights if it is going to successfully build out LR and transit. “Parking” is a hot button issue for a lot of conservative road-warrior types and sometimes even for neighborhood activists. ST would be well advised to stay out of the smart growth, new urbanism, TOD fray – particularly with the potential of a pro-car, pro-road capacity, anti-ST, Republican governor in the future. There just is no up-side for ST in picking a fight over parking. I’d offer the following compromise as an incentive to actually get some parking converted into redevelopment: ST agrees to build the 500 stall parking garage if the owners of NG agree to convert 300 stalls of surface parking to redevelopment AFTER the temporary construction staging phase is complete. I’d require that the 300 stalls to be converted be the ones closest to the station. Per the ped bridge to NCSS; it’s a great idea and should be pursued. Maybe with some sort of TIF? Who would they be picking a fight with? Is this something the neighborhood feels strongly about? Or is it the “potential” p&r users that might object? My issue is that experience in south Seattle has shown that Metro fails to adequately restructure routes to serve Link. What will be different for Northgate? People will be left with no practical way to get to Link other than continuing to drive as they have been doing. Yes, maybe in 30 years, enough TOD may get developed to provide ridership but what does that do for the people that are paying for this today for where they live today? I think the bridge in conjunction with parking enhancements at NSCC and a bus flyover is a great solution and less money to build than a garage. It should be covered and have some noise baffling so it feels less like your crossing Niagara Falls. And, NSCC should seriously look at some way to redevelop their tomb like campus to make more open. A bus flyover would be more than the parking garage. And, yes, ST still has lots of enemies. They don’t need to pick a fight with any of them. I’d build the garage in exchange for a modest amount of redevelopment (300 surface parking stalls worth). lazarus, we’re seeing mall developers start to look to mixed use. That won’t happen on any square foot we take up with a parking garage – but it’s very likely to happen given the incredibly fast commute downtown Link will provide. I sincerely doubt that we will see any significant conversion of mall parking into mixed use, and we certainly won’t see it without the addition of some amount of new parking — like what ST is talking about building with their 500 stall garage. That is exactly why building the garage in exchange for some amount of conversion later would be tempting Northgate. But the wholesale conversion of mall parking to mixed use without the addition of more parking? Wishful thinking at best…. Where did I say “without the addition of more parking”? I’d imagine mixed use will have underground garages. But that can’t happen if we take up land with a structured parking garage. ST is not in the business of TOD, and nor should they be. They are in the business of transit. Nothing more, nothing less. The Northgate owners will hold ST’s feet to the fire over “construction mitigation”, and they will get it. But construction mitigation does not mean TOD, or even mixed use. The best ST can hope for is to build a simple parking structure with a promise of adjacent redevelopment after construction. It’s not perfect, but it is a workable compromise, and “compromise” is how things actually get done. I said mall developers, not ST, would be building mixed use. Have you forgotten the original comment?? I stand by my comments: The mall owners are going to insist that ST provide parking as construction mitigation. ST should comply in the form of a parking garage, with a promise from the mall owners for conversion of approx. 300 surface lot spaces to some form of redevelopment after Link construction. If the mall developers are insisting on a permanent parking garage for construction mitigation, then we should require they purchase it – at full price – after construction is complete. Otherwise, this is ridiculous. If the mall needs more parking and it’s cost effective to provide it, they will be able to afford to build more themselves. If it’s not cost effective, they don’t need it. They’re getting a giant free handout in a station next door. A parking garage consumes valuable cash, which would be better spent on building the bridge. A parking garage costs more than a bridge over I-5. A parking garage is usable only to those with cars, while a bridge is usable to everyone. And walking across the bridge is a lot faster than driving around through all the mall traffic, then driving up and down the levels of the garage, looking for a space. And, as to connecting buses, nobody can seriously claim that a 5-15 minute wait, followed by a 5 minute bus ride is an acceptable substitute for what should be a 5 minute walk. Furthermore, a parking garage is about one thing only – meeting the peak weekday demand for people taking the bus downtown. A bridge, besides helping out station access, will be usable by people living in Northgate who go to school at NSCC, and by people who live in Licton Springs and want to shop and Northgate Mall, but don’t want to wade through the mess of trying to park there. If money were infinite, I would have no objections to the 500 stall garage either – as you said, surface lot or garage, the land footprint is the same. However, the reality is that money is not infinite and the construction of parking garages is very expensive. And whatever money gets spent on the construction of the garage is money that is not available for something else that would be more effective in actually improving mobility. I would be very disappointed in ST if we didn’t have the money to built the bridge because we had already spent our available funds on the parking garage. These are all good points – however if the City is serious about Northgate being an urban center, then the era of free parking at the office sites around the transit center must end also. With the mall on an adjacent property, I am not sure how the City would go about changing that nor am I sure how wide pay parking should be implemented. Are you saying the city could mandate pay parking on private land? No, he’s saying the city should stop offering free parking on public land. The private landowners will be disinterested in providing free parking for non-customers either, and so demand for stash-your-car-all-day facilities will drop. Northgate merchants could offer parking validation the way other urban merchants do. I think those lots will take care of themselves. As demand for parking becomes more intense and properties are redeveloped the cost of parking will only go up, and those that currently cover the costs will think twice. I very much doubt in the short-medium term Northgate will charge for parking, but office tenants and commercial spaces in new buildings are a different question. As Adam says – all we have to do is *let* the market start making that pay parking, and not add more free parking to compete with it. It will happen in time. Thanks for the cogent editorial, Renee. The Maple Leaf neighborhood will arguably be the one most impacted by Northgate Urban Center (NGUC) parking both during LINK construction and during operation. During the operational phase, the first two years when the NGUC LINK station is the northern terminus are the most problematic. The Maple Leaf Community Council, of which I am currently the Land Use & Transportation Subcommittee Chair, has been advocating for a pedestrian bridge as an alternative to a built garage for a few months now. We believe it is fundamentally a waste of money to build a parking garage for what is likely to be a shorter-term need. Additionally, as Renee and some commenters point out, building a pedestrian bridge at roughly the same cost has benefits over and above what could ever be accomplished by a parking garage. We believe a pedestrian bridge, combined with a limited-duration Residential Parking Zone starting about this time in 2013 and lasting until the Shoreline station is open, are the best ways to balance the Maple Leaf community’s short-term parking concerns with our overall vision of affordable, vibrant, and place-making Community-Oriented Development in the NGUC. Has there been any movement on Sound Transit on building a pedestrian bridge over I-5? That’s a fine argument you are making here -but are they listening? +1, what are the odds that the bridge is actually going to happen? I’m totally for the idea, but trying not to get my hopes up if it’s not going to happen. Seems like Metro could save some cash by not having to run so many buses between NSCC and the transit center if folks can walk instead. Is Metro advocating for the bridge to ST? Are they Penny’s garages actually fully used? Can they be leased? See, this to me seems a like case where compromise rather than extremism is needed. It seems like the residents are more than willing to exchange a short drive to a station, and a ride on a train for a long point to point drive, high parking fees and clogging up highways. I would be celebrating this accommodation as a victory for transit. The next stage might come in 10 years, when cars start to get automated and people don’t have to park at all…can just send their cars home, or use public/private robot taxis. At that point, you can tear the garages down…but for now. John, spending our limited funds to build the bridge, rather than the parking garage is not extremism. Even without the garage, there will still be plenty of parking available at Northgate station. And a lot of the people that currently drive there will be close enough to walk instead, once the bridge is built. If for a few years, the parking supply isn’t quite enough to satisfy the peak demand when the price is free, that’s something I’m willing to live with. Charge a small fee, so that anyone who wants to park at Northgate will be able to reliably find a space. And those that don’t want to pay the fee can walk, bike, or bus there, or park on the street. For me (and for you, really) the issue is selling the rail corridor. To that extent, your job is to get people off I-5 and onto LINK. You should focus on that, getting people to the station, even if needs some incentives, like the guaranteed availability of parking. The first time a few people get turned away at the lot is the last time they will automatically consider rail as a transit option. A parking garage is a very minimal expense and could greatly sweeten the pot. After getting groomed to using rail, maybe people will in fact consider taking the bus there. For someone who lives right across the freeway, a pedestrian bridge is a very minimal expense to sweeten the pot – cheaper than the cost of the parking garage. Connecting buses take far longer than walking the direct route, besides being less reliable, and should not be considered a substitute. And with the bridge, even with the garage too, station access from Licton Springs will be faster by walking than driving, when the time it takes to park is taken into account. I used to live just north of North Seattle Community College, and I explored lots of methods of getting to the transit center. Driving was at least 10 minutes, more than half of which was spent driving through the parking lots of my apartment building and Northgate TC. Biking was about 7 minutes, but risky because you never knew if bike racks on the buses were going to be full or not, and leaving the bike at the P&R all day isn’t particularly safe. A connecting bus could take anywhere from 5-20 minutes, including wait time, even though the bus did stop right at my front door. Walking was a predictable 15 minutes and running a predictable 7 minutes (although I had to be very careful crossing 1st Ave. along Northgate Way, and the sidewalk was narrow and ugly in places). So, even without the bridge running was the fastest option, actually faster than driving, and as time went by, that became my everyday choice. With the bridge, the time to either walk or run would be cut in half, and the quality of the walk/run would have been a lot more pleasant. Furthermore, the bridge is not just about station access. It’s also about providing travel options for local trips between home and Northgate Mall or home and North Seattle Community College. Yes, a student at NSCC who lives in Northgate and uses the bridge to get from home to class won’t be contributing to Link’s ridership. But you can hardly call the bridge a waste. On the contrary, walking is the most sustainable mode of transportation that exists and is something we should be actively encouraging. Forcing people to go 1/2 a mile out of the way and pass under a busy freeway bridge, followed by a dangerous intersection, followed by a deserted, narrow sidewalk next to the mall is not the way to encourage people to walk. Providing a grade-separated bridge, with no cars to contend with, that takes the direct route that people want to go is the way to encourage people to walk. It’s hardly extremism to have only 2000 parking places next to Link instead of 2500. So build the extra 500 and be done with it. Why build 500 more stalls, and be stuck with them in perpetuity, when ST could lease stalls off-site, and run shuttle service, or valet service, for a tiny fraction of the cost of a new garage? The pedestrian bridge would be the best option, but if not that, there are other options that don’t involve building new parking. Would this parking garage or pedestrian bridge stand up to the same cost effectiveness formula that ST used to determine it wasn’t worth building housing above Roosevelt station? Their formula might be flawed, but it’d be interesting to see how it’d shake out for these projects. As one who went to school at and worked at North Seattle Community College over the years, a connection from NTC is imperative! At least I was successful in persuading the transit planner at the time to move the routes using Northgate Way (345, 346) to going past the college so that folks didn’t have to walk there from the corner of Northgate Way and Meridian, which is a crunch point for SB automobile traffic to the college. Still, one has to time those buses right to make the connection from the south, or take about a 5 minute walk (for an able-bodied person) up 1st NE and across 92nd, and the first part of that walk is uphill and hazardous. At the very least, decent sidewalk and bicycle connections should be made. But, in light of ST’s train station’s location, even better would be either an elevated walkway or one that goes underneath the freeway (tunnel), though there are safety concerns with both. Another concern with the plan is the lack of general bus connections from the north, though this would be a short-term issue. That is, a bus from Snohomish County won’t ever stop at Northgate to either connect with the light rail, a moot point when the light rail extends further north, or to allow a connection to North Seattle Community College. I’d like to see some option for addressing the latter. I don’t have a silver bullet for Snohomish connections to Northgate Station, but the less that is spent on an unwanted parking garage, the sooner Link can open to all those other parking stalls in Lynnwood. Speaking of parking stalls in Lynnwood, if the pressure to build a parking garage at Northgate is coming from Snohomish County politicians, why not run more buses specifically between Snohomish County parking lots and Northgate Station for a couple years? Bzzt, subarea equity. North King money will go to improvements in North King. when first implemented in fall 2003, routes 345 and 346 used North 92nd Street, as routes 5 and 75 did and do; routes 345 and 346 never used NE Northgate Way, that is mired in I-5 interchange congestion. I’m going to make an additional point. The freeway is a barrier. If you’re going to provide parking, surely it would be wiser to split the parking onto both sides of the barrier, avoiding the bottleneck, and have a walking connection between the two sides?